Battle Games NH: Are You Ready To Battle? 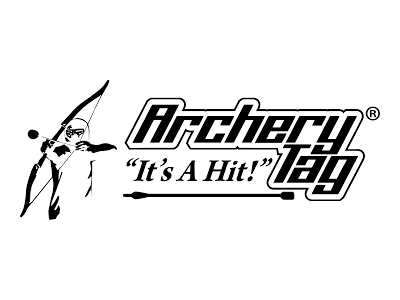 Archery Tag® is played similar to dodgeball with bows, masks and patented foam-tipped arrows! Super-powered NERF blasters for adults and children 13+. Like playing Fortnite in real life! NERF Zone features all the darts and fort building items you can imagine. Team assault, target attack/defend and so much more! Archery Tag® is the ORIGINAL family-friendly combat archery sport. Archery Tag® is played similar to dodgeball with bows, masks and patented foam-tipped arrows! NERF Zone is an area of athletic field designed especially for kids to run, play, build and use foam weaponry. NERF Zone features blocks and fort building materials along with fun obstacles for children to run and play on. Sessions are 60 minutes long and our staff will help coordinate such activities as attack/defend and target protection. Players can bring their own NERF weapons, borrow one from us or purchase one from our store. What is a Rival Battle? NERF Rival is an all-new, high-performance line of toy blasters. These super-powered NERF weapons shot a small yellow foam ball at greater distances and speeds than your typical NERF blaster. The Rival blaster performs at a level closer to Airsoft or paintball, but still without the mess. Our Rival Battles include multiple games and opportunities for players to strategize, gain more ammo, complete missions and level up weapons, just like a video game! Sessions are 60 minutes long. Email andrew@BattleNH.com to book! How much does Battle Games cost? 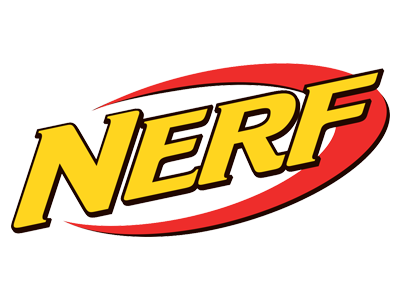 NERF Zone has an admission price of $15 per player (ages 7-13) and includes access to our NERF arsenal. Players may bring their own, non modified, NERF weapons. Players may also purchase a new NERF weapon from our on-site store. Parents/guardians and family members may also participate in NERF zone for the standard $15 admission price provided they have a child playing. Parents who are only watching from our viewing section will not be charged any admission. Rival Battle has an admission price of $20 per player (adults and children 13+) and includes mask rental, ammo and access to our arsenal. Players may bring their own, non modified, NERF Rival blasters. Do I have to book every spot? No. However, if you don’t book every available spot, you will most likely be paired with another group of participants. The only way to ensure that no other participants will be joining your party is by booking all the available spots or by making it a private game by checking the box next to “make activity private”. Yes. If you are looking to “walk-in” we recommend you call us at (603) 232-4042 to make sure we have an opening for you. Archery Tag® is offered to adults and children 10 years of age and older. If you have a member of your party younger than 10 who would like to participate, we ask you to make the activity private and book all available slots. NERF Zone is offered to players from 7 years of age to 13 years of age. Parents/guardians and family members may also participate in NERF zone for the standard $15 admission price provided they have a child playing. If you have a member of your party younger than 7 or older than 13 who would like to participate, we ask you to make the activity private and book all available slots or book an event. Rival Battle is offered to adults and children 13 years of age and older. 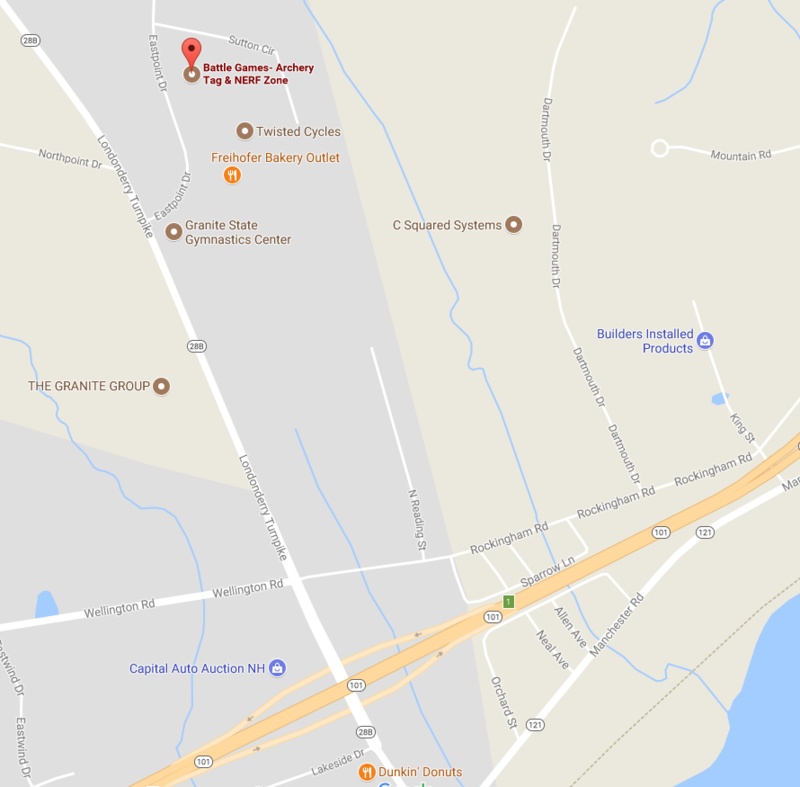 Where is Battle Games NH located? 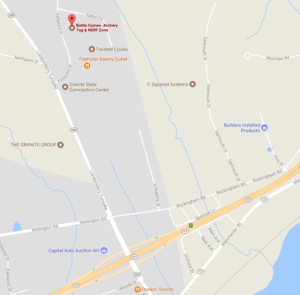 We are located on Route 28 North off of Exit 1 on 101. All of our games begin promptly at their scheduled time. Please arrive 15 minutes early in order to hear the required instruction. Participants who arrive after their scheduled time will not be allowed to participate. We recommend athletic clothing and sneakers for all of our activities. Cleats of any kind are not allowed. We do not offer refunds within 24 hours of your scheduled booking time. Fantastic Sport. Great company to work with. They care about their customers and take great pride in their sport. Do not settle for imposters, there is only one Archery Tag! My son and his friends had a blast in the Nerf Zone. It was great to see them all running around and having fun away for the TV! Our company had a very fun time at Battle Games. The staff was accommodating, the facility was clean and our employees had a great time! We will be back! New Hampshire’s first and largest interactive Escape Room experience!